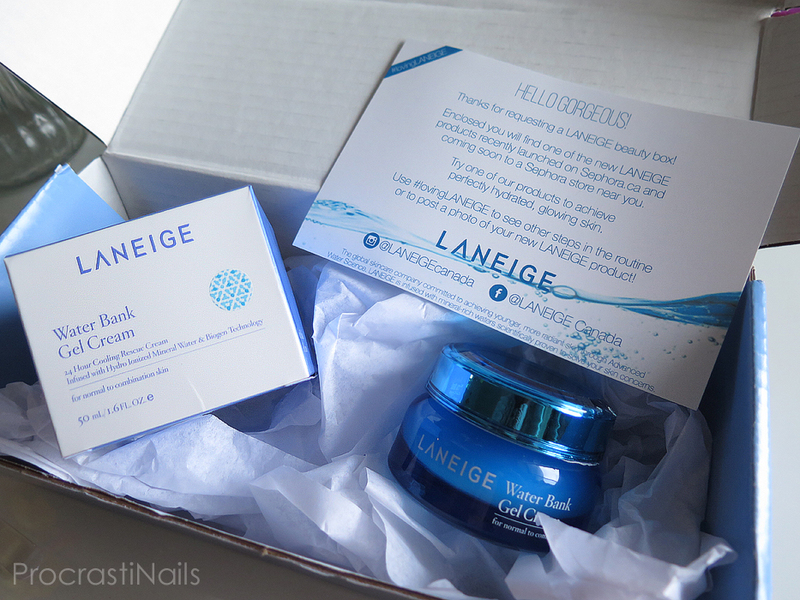 Laneige recently launched in Sephora in Canada and to get the word out they teamed up with Influenster to sent out the Laneige VoxBox! Each box contained one of four products: their cleanser, their serum, their cream or their sleeping mask. The Water Bank Gel Cream that I received claims that: "The six hydrating ionized minerals—zinc, potassium, calcium, sodium, magnesium, and manganese—in hydro ionized mineral water replenish and lock in moisture while winter cypress polysaccharide extract soothes irritated skin. Cooling and ultra-light, its silky texture makes it the perfect choice for warm climates and oily skin, absorbing instantly and delivering 24-hour essential hydration, protection, and revitalization." This gel cream moisturizer comes with a cute clear plastic applicator wand that can be used to scoop product. At first this felt really unnecessary (Is this a normal thing for potted moisturisers to come with? Obviously I am not well versed in this world.) but after using it once I liked not having to stick my fingers in the pot to get product. It seems more sanitary! The product itself wasn't a thick as I would expect a cream to be (it's definitely more of a thick gel), and you don't need as much of it as you think you might. The word 'gel' made me feel worried it might be sticky or greasy, but I didn't find that to be a problem at all. It absorbed nicely. 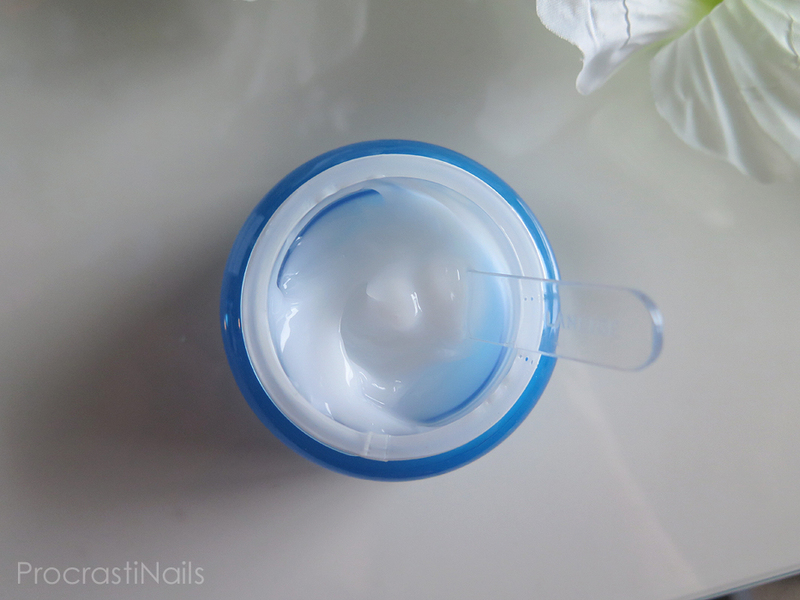 The Water Bank Gel Cream comes in a pot with 1.6 oz of product which I found to be a good amount. I like the bright blue packaging, though unfortunately the lid of my pot was a bit smashed along one edge when I got it. It wasn't enough to impact the integrity of the container, just enough to leave some spiderweb cracks, but I still felt a bit :( about it. I was pleased that this product had a very light and clean scent (slightly floral) and that there was no real scent left after it absorbed. I tried this cream for two weeks on my face (and on-and-off on my hands) and I definitely noticed a difference. My skin was much softer after I used it, and as long as I didn't apply too much it completely absorbed with no leftover residue. It fits well into my current morning beauty regimen so I do plan to keep using it. The product retails for $42 on the Sephora Canada website though, so unfortunately I won't be continuing to use it after I'm done with this pot. That's a bit pricey for moisturizer for me! 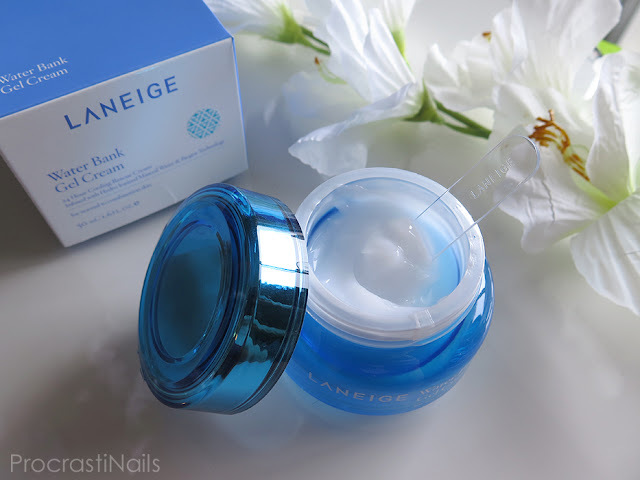 Have you tried any Laneige products? What did you think of them? Let me know! The cream looks and sounds super nice! I got the sleeping mask. All the Asian moisturizers I have came with little spatulas. I think it's to keep things sanitary and help with portion control, lol! There are several really good Asian skincare items for much less than $42, you should check out AsianBeauty on Reddit. I've learned so much, it's been really fun! I prefer to use a little spatula anyway, it stops product collecting under my free edge!